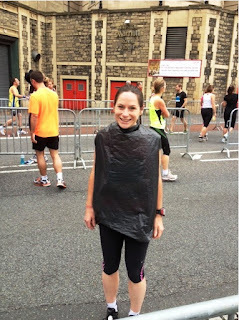 I wasn’t nervous about Bristol Half Marathon. I had told myself that it was a training run for Liverpool Marathon rather a chance to try and beat my previous PB. 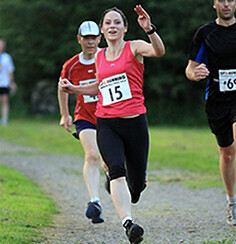 “But surely every race is a chance for a new PB?” Evil Me sitting on my shoulder said. I’d done one half marathon previously in 1 hour 44. A friend at work had told me to go for a sub 1:40 time but I’d programmed the Garmin and it was a 7:38 minute mile pace. Far too fast. That had been quickly un-programmed. But ... still the thought was there. I was up at 5:50am on a Sunday wearing Lycra and eating porridge. Definitely race day. Church tends to frown at this kind of dress. Parked in a multistorey car park in the centre of town and followed the streaming crowd of runners. Nervous bladder was shouting orders so got there in double-quick time before I ruined the Lycra. Discovered that the compartment I’d kept my safety pins in in my handbag had got covered in Calpol so the pins were difficult to undo but on the plus side if they didn’t go through the fabric, I’d be able to STICK the numbers on. Donned my amazingly alluring bin bag (I’m practising for when I’m a mad old lady with 10 cats) and went to find the Blue starting pen. I stood next to lots of normally dressed runners and Snow White. Yes, a 6ft tall bloke in a dress. Dressed in my bin bag and standing at not quite 5”4 I felt like a cast member. Possibly Garbagey? Modelling the latest race fashion. Who needs normal clothes? I felt pale and sick and couldn’t talk properly. And very, very nervous. And I couldn’t work out why. This was a TRAINING run. I’m not normally this neurotic before races. Am I? Maybe I was allergic to Snow White’s perfume. I’d expected a warm up but apparently this had happened about 10 minutes ago somewhere completely random. OK then. No warmup. I’d had about a mile walk trying to find the loos, luggage drop and start and if I couldn’t warm up over 13.1 miles then I wasn’t running fast enough. The first mile was very congested - I was doing about 8:20 m/mile as I couldn't get any speed up as so many people in front. I had to keep moving past people, but I was really trying hard not to dodge around too much and waste energy so early in the race. However, I still couldn’t stop smiling. I was in a crowd of thousands of runners and we were all going for a run together. I LOVE running and so does everyone around me! This is AWESOME! Yes. I probably looked completely mental. The crowd of runners started moving properly through the town and my legs defaulted to a 7.30 m/mile. It didn't feel too tough so I stayed at that speed and thought well I've got up to 7:57 mile to play with to get a PB as my previous half marathon was at a 7:57 minute mile pace. The route looped around the town and came out along the river with the River Severn on our left and steep high cliffs on the right. Then all of a sudden the Clifton Suspension Bridge was visible, high up above our route. We ran under it and through a tunnel and then out into bright light again. For a couple of miles there was a double back so you could see the elites and the white wave coming the other way. I looked at them thinking "Next year I’ll be over there!" Positive thinking. Not realistic but positive nonetheless. Completed the loop and came back and saw Mr coming the other way. We managed a high 5 at speed and I carried on with a goofy grin! The rest of the course was through town. There were regular water High 5 gel points which was great as High 5 were the gels I’d practised with. I alternated taking these with Mars Bar slices and carried a water bottle with me from about mile 5. The only problem was that the marshalls were giving them out without caps. This was great for a Swig-and-Throw but not great for someone to carry. The route was varied and interesting and surprisingly in a city there were lots of different surfaces to run on. We went around a square which was on a sandy path and had great crowd support and about mile 10 – 11 was cobbles. I was very relieved at having done so much trail running as cobbles could have been really awkward especially with tired ankles and feet on cobbles. With about 2 miles to go there was a short sharp hill and a ruined abbey on the left and I could see we were getting closer to the big cathedral we'd started near - the spire was a good navigational point but to make up the miles the route planners had put in lots of crossovers and twiddly bits so the spire never seemed to get any closer. I kept the speed constant at 7:30 m/mile and I seemed to be passing a lot more people than were passing me which is always reassuring. 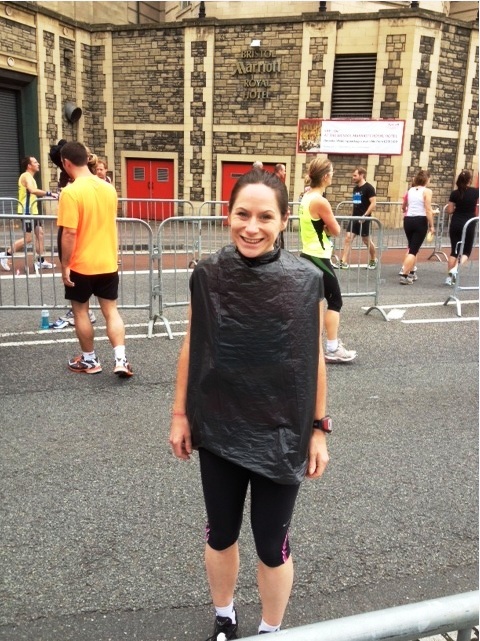 I had started in the wrong place in the Reading Half Marathon and had been passed by 500 (!!) people. Sorry guys! I passed the sign saying 400m to go ... 300m to go and then irritiatingly, the Garmin beeped to say I was at mile 13.1 and it stopped recording! But I was still about 200m away from the finish. Argh! The last mile was tough as the last mile always is and I could see the finish tower in the distance. The people around me were speeding up but I kept the even 7:30 pace all the way through and remembered to raise my arms for a good photo at the end. Rather than my usual picture of me stopping the Garmin. Bonus. Pleased with my new PB ... and relieved to be allowed to stop running. My Garmin said 1:38:22 but I knew that it had been slower than that as it had finished too soon. The finish funnel was well managed and we were loaded up with water, a technical T-shirt, medal (which I made the kid loop around my neck so I could pretend I was at the Olympics) and a goody bag with flyers, a Daily Post and a kitkat. Deluged at the end by people handing out flyers for different races and High 5 tablets so I just opened my race bag and let them throw everything inside. Overall, I LOVED this race. Hardly any hills except for the one at mile 11, great marshals and a scenic route. The finish funnel was well managed and kept moving although it would have been helpful to have had the bags first so we could load everything into those instead of getting those last. Also nice to have different terrain, especially in a city centre race! The crowd support was fantastic and the marshals were cheery and helpful. However, the race maps were bad and very confusing – the green with all the portaloos and luggage area had a big church on one side (the spire we kept circling) and this wasn’t even shown on the map. We had to grab a local to explain the map to us! It didn’t matter much to me as I had my Garmin, but some of the mile markers appeared to be missing.